One of the common misconceptions about labor and delivery involves the various pain relief options that are available. In particular, many first-time moms might assume that the options include epidural or no epidural. But, there are various other medication and non-medication forms for pain management. As an expectant mother, you have more than likely heard of epidural anesthesia. One of the most common medical pain relief options available, an epidural is a regional anesthesia that blocks pain in a particular part of the body, a pain management option chosen by more than 50% of women giving birth at hospitals. Before epidural anesthesia is administered, the pregnant patient is given intravenous (IV) fluids. While sitting up and leaning forward to arch your back, an anesthesiologist will apply an antiseptic solution then inject a local anesthetic to numb the area. A needle is then inserted into the spinal cord in the lower back followed by a catheter which is threaded through the needle into the epidural space. Once the needle is removed, the catheter remains in place and allows the medication to be injected either periodically or continuously. Pain relief typically occurs in around 20 minutes. While an epidural does not slow dilation, it may slow your ability to push effectively. As with any medication, epidurals do have potential side effects such as nausea, itching, shivering, drop in blood pressure or severe headache. If you have had spine surgery, are allergic to anesthetic or have blood-clotting problems, you may not be able to get an epidural and will need to consider other options to relieve labor pain. 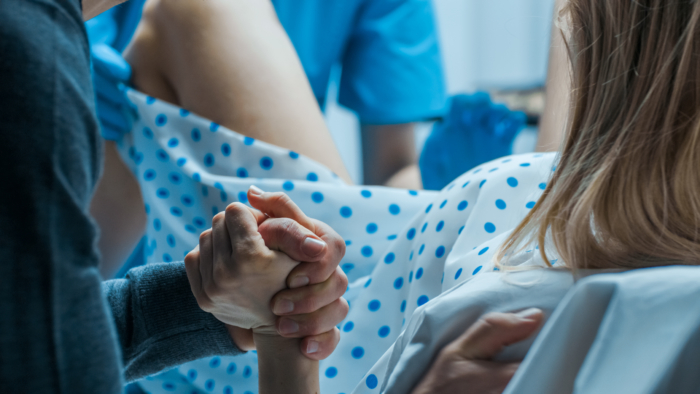 For women who choose not to get an epidural, or are early in labor and would like to wait to get an epidural, pain medication through an IV is an option. This type of medication relieves pain without the loss of feeling or muscle movement that occurs with an epidural. While IV analgesics can help to dull the pain, they typically do not take the pain away like an epidural may. They are commonly administered with a single shot or intravenously (IV). It’s important to know that analgesics are another term for opioids. They have the potential to make your baby drowsy, so may not be an option if you are within an hour of delivery. Those who choose to use nitrous oxide during labor may still have an awareness of labor pain, but many women find it helps them relax and decreases their perception of labor pain. Your body temperature may change drastically throughout the labor and delivery process. A hot or cold pack can help relieve the pain and discomforts that arise with contractions. Cold therapy can useful for reducing swelling and inflammation. Similarly, heat therapy may help relieve severe pain and tension in your muscles. By relieving major muscle tension and loosening your body, you may be better able to rest between your contractions making for a more enjoyable labor and delivery. Another common non-medical labor pain relief tactic is to ‘just breathe’. Breathing along with your contractions can significantly help you control your ‘labor waves’ and offer relief. During your pregnancy, consider taking a Lamaze class or learn guided meditation techniques. Depending on what feels most natural for you, you will want to either take deep inhales that expand your diaphragm or short patterned breaths that keep you focused more on your breaths than on the pain. Not only does rhythmic breathing help pregnant women feel more relaxed and in control during labor but increased oxygen also helps the individual in pain feel stronger and have more energy during the pregnancy and labor. Additionally, patterned rhythmic breathing can quickly become an automatic response to pain which can help mothers even after their pregnancy to manage stress in their everyday lives. Similar to breathing exercises and rhythmic breathing, you can use music, imagery, and conversation to avert your focus and still feel in control during labor. According to the College of Nursing and Health Sciences, music therapy is one of the most powerful non-medical treatments for labor pain because music targets the parts of the brain that also respond to pain and replaces them with feelings of happiness and calm. Similarly, by choosing imagery such as your phone, your significant other’s face, or an object in the room, you can focus your attention on something other than the pain which can help you cope. Lastly, just like medical professionals recommend talking to people who have experienced a trauma such as a car accident, having a conversation as you labor can help shift your focus away from the pain. When it comes to options to relieve labor pain, there is no one size fits all solution. What works for you or what you feel most comfortable with may be different than another expectant mother. Of course, any woman can choose not to have any medications for pain control in labor, and if this is your desire, it may be helpful to take a childbirth class with this focus or to work with a labor support person, like a doula. Your doctor can help answer any questions and address any concerns you have about the various options and offer suggestions about what may be best for you. At Raleigh OB/GYN, our goal is to help expectant parents have a positive labor and delivery experience. For more information or to request an appointment, call (919) 876-8225.